The site is in the village of Culcheth and is inset from the surrounding Greenbelt. It is bounded by residential roads to the east and west and existing housing and gardens to north and south. The vast majority of the surrounding buildings are one or two storey detached family dwelling and of relatively low density, the majority being constructed in the 1960’s. Protected trees line the eastern boundary and a belt of trees runs north/south across the centre of the site. The eastern half of the site is open having been historically cultivated. A ruined tithe barn, thought to have been constructed in 1676, associated with Culcheth Hall, stood on the site until recently. Historic routes passed through the site, tracking along the south side of the northern boundary, linking routes to the east and west via the tithe barn. A framework for development of the site for residential use has been established and informed by historic usage, movement and access patterns. 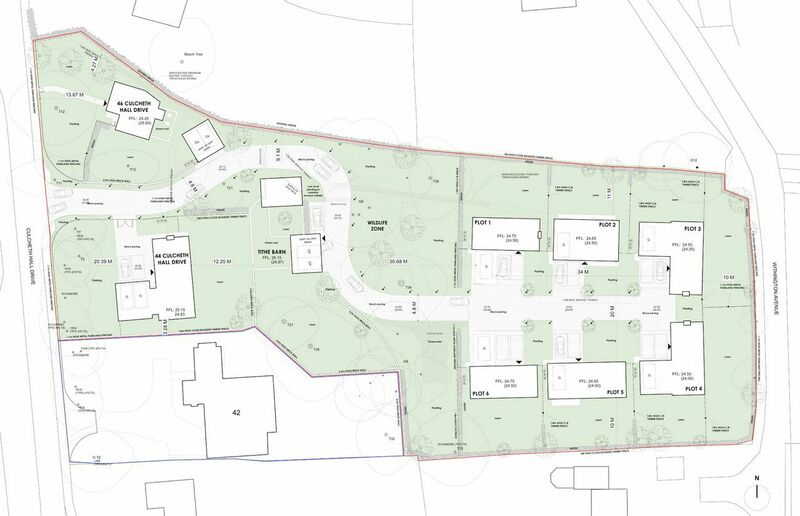 The framework has then been refined to recognise the more contemporary suburban surrounding development to a point where it has unfolded into three areas, supporting the creation of nine new detached family homes of varying size and type: To the west, fronting onto Culcheth Hall Drive, two new two storey properties are proposed. 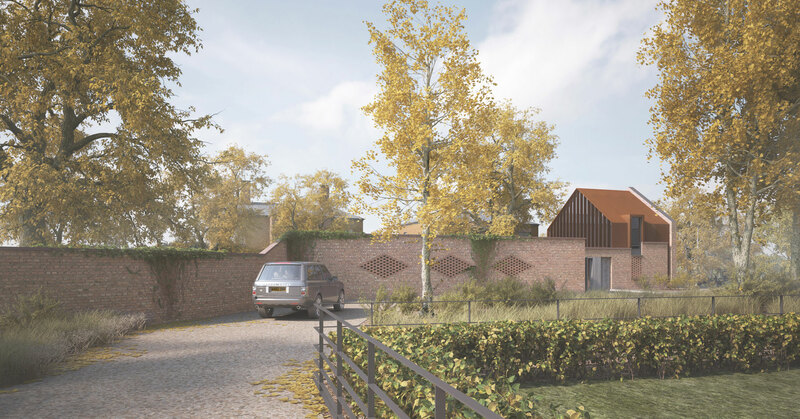 These houses have been positioned to respect the existing surrounding grain of the suburban development in terms of scale, spacing and position whilst reinforcing the existing rhythm of development along the road. addition creates its own inward looking courtyard. To the east of the site, the character of the site changes and opens up to the farmland beyond. 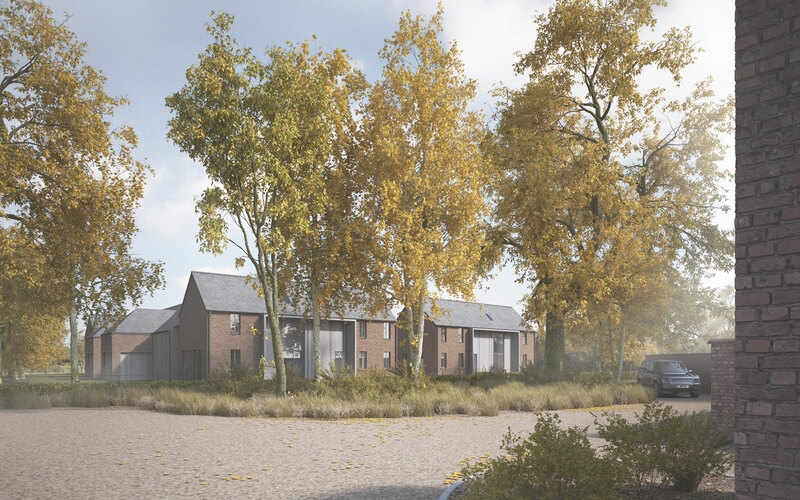 Here, it is proposed that a courtyard is included, defined by a collection of six new dwellings arranged around its perimeter. This type of layout responds to the edge condition and is synonymous with the periphery of villages and the transition to the open territory beyond.